Preschool fire safety lessons coordinate nicely with a studies on safety, emergencies, and community workers. If possible, arrange for the students to visit the local fire department for a quick tour. Another alternative is to ask a fireman to come to the classroom to speak on fire safety for children. Gather the students in a reading circle and read Fire Safety in Action by Mari Schuh. Discuss the basic fire safety rules the book addresses, such as campfire safety, practicing fire drills, planning escape routes, and what to do in case of a fire. Ask the kids to tell about any plans their family has established in case of a fire. Stress the importance of knowing their own address and phone number in case of an emergency. Provide a play phone, or disconnect a real phone from it's power source, and allow the kids to practice dialing 911 and reporting a fire. Arrange for a fire drill with the kids. Discuss the importance of leaving the building immediately, staying low to the ground, remaining with the group and never returning to a burning building. After reading and talking about the story, teach the kids this song to help them remember important facts about fire safety. Sing the song to the tune of B-I-N-G-O. Do you know what to do? Oh. Get out quick, get out! Stay very low and go. Go! Verse 2 – Repeat first two lines. Stay out! Don't go back. Don't go back in the house. No! Verse 3 – Repeat first two lines. Get help! Call for help. Call 911 for help. Oh! Collect the paper towel roll. One is needed for each student. 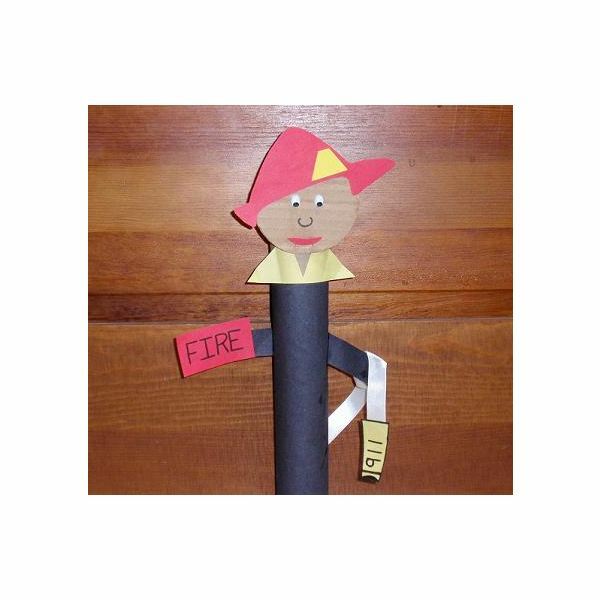 Print out the fireman template on cardstock and create patterns for the children to trace onto construction paper. Another option is to print the template on white paper and have the kids color them. Using the template, cut out a cardboard circle (one for each project). Staple the cardboard circle to the top end of the paper towel roll. This will become the fireman's head. Give the children patterns and construction for tracing the body parts. You may also decide to print the template on white paper and have the kids color the parts. Instruct them to cut them out. Provide each child with a paper towel roll (with the head already attached). Stand the roll up straight and wrap a sheet of black construction paper around the base. Fasten with glue. Have the children attach the two triangles directly underneath the fireman's head to form a collar. Cut two short rectangles from the black paper and glue them to the side to form arms (fold a small section under to create a tab and glue only that portion). Attach the hat, googly eyes, and scraps to complete the head and face. Help the kids print FIRE on the rectangle sign and 911 on the fire hose tip. Cut a short piece of ribbon or string to make the fire hose and glue the hose tip on the end. Secure the hose with glue to the back side of the fireman and drape it over one arm. On the other arm, glue the FIRE sign in place. Give the kids stickers or other scrap materials to add final decorating touches to the fireman craft. Preschool fire safety lesson plans are an excellent way to teach children fire safety basics and help them remember important facts that may one day save their lives.